Last year I wrote a post about how our granddaughter, Ambrynn, had won 3rd place in the Federal Junior Duck Stamp Contest in Florida. If you need a refresher go read this. I’m glad to wait. Okay. All set for some amazing news? 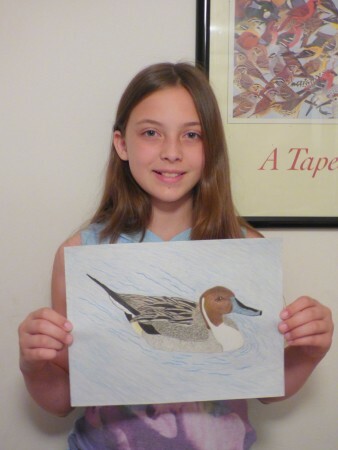 This year Ambrynn entered a drawing of a pintail in the same contest and she won . . . wait for it . . . FIRST PLACE for her age group, which is 4th through 6th grade. We are so proud of her! She is a fantastically talented girl, that’s for sure. As someone who can barely draw a stick figure I am super impressed with her abilities. I love the shading and coloring and attention to detail. Heather, Ambrynn’s mom, pointed out something interesting when I chatted with her yesterday. It seems that Ambrynn is following a pattern with her wins. In kindergarten she won an honorable mention, in 1st grade, 3rd place, in 2nd grade, 1st place, then in 3rd grade an honorable mention again, in 4th grade she won 3rd place again and now, in 5th grade she has won first place. Pretty cool and amazing when you think that she has won an award every year that she has entered! It’s hard to be so far away from Ambrynn and her parents, Heather and Brant, but news like this makes us all feel a little closer. Wonderful work! Please extend my congratulations to Ambrynn! Congrats to your granddaughter! She has great talent. I think it’s your grandmotherly duty to brag about your granddaughter, and talented Ambrynn makes that easy to do! Congratulations to her on her wonderful art work! Wow that is wonderful! I would love to be able to draw *anything* – but I love seeing what others can do. Congratulations to her! I love Mary’s thought process! And Congratulations Ambrynn! She has a bright artistic future for sure! That is one impressive duck. Good for Ambrynn for continuing to challenge herself, and you for bragging about her. Holy cow that is so fantastic! From one who struggles with stick figures also, I am so impressed by her amazing skill. Congratulations Ambrynn! How wonderful to have such a talented granddaughter! Her art is amazing and so well done! That’s an impressive drawing! How wonderful that her talent is being recognized. Yay! Congratulations!! That is fantastic work. 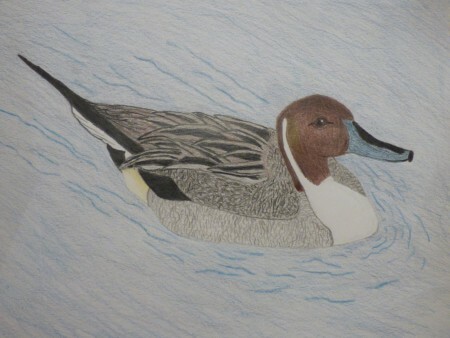 She must draw a lot in her spare time, too, and I’m thinking it can’t always be ducks… I’m curious to know her favorite subject(s) when she’s in the zone! And, oh my, I shouldn’t be shocked at how she’s grown (Ambrynn and my nephew Mack are pretty close in age, so…) but I am!! Beautiful artwork! Kudos to Ambrynn! Nice to see a family talent and tradition continue onto the next generation. Congratulations- that is a really big deal, and she is very talented. And I know time has gone by but–omg- she look so grown up!